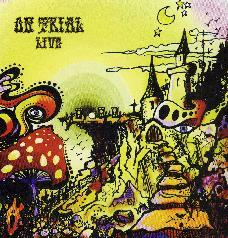 On Trial is Denmark’s longest running psychedelic rock band (1986-present) and has released many records. This is the bands first real mass produced live record. The Psychedelic Freakout Party (Burnt Hippie Recordings) was released as a double vinyl only record in 300 copies and was all audience recordings, but captured the spirit of the band in the late 90’s. This CD was recorded in June 2002 at Loppen in Christiania (despite the sound of a huge crowd, which was added and I think it comes from Deep Purple Made in Japan!) It was the last gig with Anders (Guitar) and Guf (Drums) before they left to play full time in Baby Woodrose. It is a pretty standard set for this time period. The CD begins with Higher (from the Bad Afro 7" record of the same title). It features a good mix of tracks from all the main records, Head Entrance (Blood Butterfly, Lovecraft), New Day Rising (Flashing’hast, Do you see her, Sleeper), Blinded by the Sun (Blinded, Everything, Downer and Driver). Also included is a jam with a guest sitar player. The CD ends with a rocking version of Parchment Farm. Great stuff. For more information you can visit the On Trial web site at: http://www.ontrial.dk. Visit the Molten Records web site at: http://www.molten-records.com.